Sold by Artisan Owl and ships from Amazon Fulfillment. 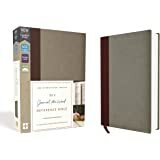 NIV, Journal the Word Reference Bible, Cloth over Board, Burgundy/Gray, Red Letter Edition, Comfort Print: Let Scripture Explain Scripture. Reflect on What You Learn. 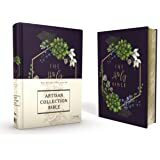 This Bible is stunning! The cover says, "God is within her. She will not fall." 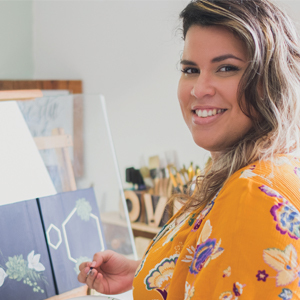 It's mass printed, but has a hand painted look and is designed by artist Edna Marie Esparra. The sides of the Bible are gold. 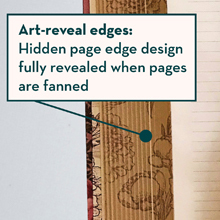 The inside pages are typical of a Bible pages except it has wide margins with lines to make it easy for journaling and notetaking (no illustrations interspersed like the illustrated Bibles). The cover is smooth and shiny, with heavy cardboard (not bend-y like imitation leather Bible covers). Over time, I could see the edges of the covers getting bent or splitting over time, but that just means I should probably sew myself some kind of Bible cover or small tote to carry it in to protect those edges. It's a really, really minor issue for me with an otherwise lovely Bible that I'll be excited to use! 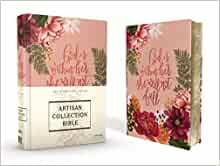 This Bible is part of the Artisan Collection by Zondervan. There are four different covers (all different colors and different hand painted designs on each). 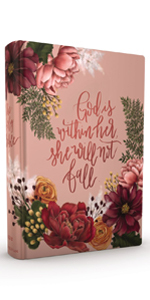 I haven't seen those Bibles, but I'm assuming they are just as stunning as the pink floral cover. The navy succulent cover is my second favorite of the collection. 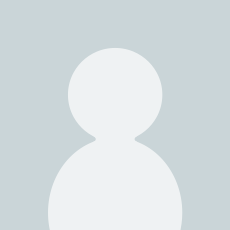 Note: I got a copy of this Bible in return for me posting my honest review of the Bible. 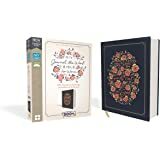 I selected this Bible for my wife as she is a fan of the NIV translation and I thought this attractive Bible would appeal to her. I was right. It is more than just a pretty reader’s version, though. 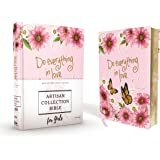 I should mention up front that this is not a study Bible of any kind; there are no provided study notes, no cross references or anything like that. If you’re looking for a Bible that has a bunch of study aids or historical notes, this is not the Bible you want. 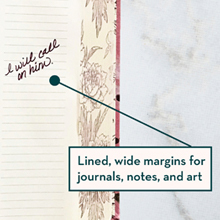 However, what it does have is an area on every page for making notes and for writing. 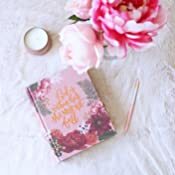 This is handy when you want to express your own thoughts about a passage, journal how a verse has ministered to you and more. 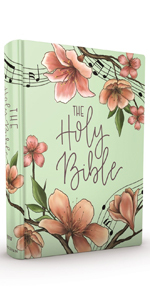 The visual appearance of this Bible is probably the biggest selling point, and I would call it “feminine” in looks. 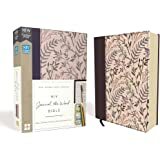 The outer cover is cloth-covered cardboard and has a floral print pattern with a salmon background. 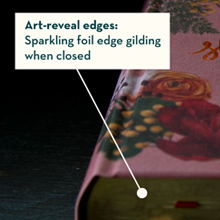 The edges of the pages, though, are unique in that the flower pattern is visible in the gold edging when held at a slight angle. Opening this Bible reveals more surprises. 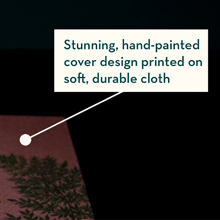 In addition to the writing areas, the font Zondervan used for this is something they call “Comfort Print” which I initially thought meant large print. 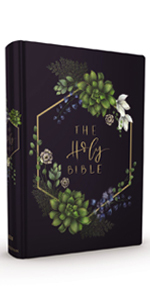 While it is modestly larger than typical Bible print it is not large print in the typical sense; instead, the font has somewhat curvy, soft edges in spite of being a serif font and it is pleasant on the eyes. However, to me the fact that the pages are not blistering white but are instead an ivory color is what makes this Bible easy on the eyes and quite attractive, more so than the font itself. Instead of just one ribbon marker, this one has two, in two different colors. 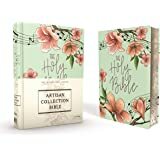 I have not seen any other Bible that has more than one and it is absolutely a welcome feature. 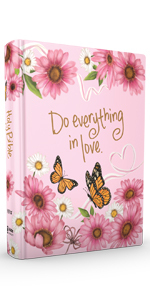 This is a really nice Bible, geared toward women for the outward floral design and colors. It’s very distinguishable and the print is very easy on the eyes. It’s a perfect gift idea too, that is sure to be appreciated.